Turkey has been a part of Australia’s history, dating back to the ill-fated Gallipoli campaign in World War 1. Paying your respects to our fallen soldiers at Anzac Cove is an emotional rite-of-passage for many Australians, and is well worth the trip alone. However, Turkey also offers plenty of other options for holiday-makers, including its culture, World Heritage Sites and the architecture of numerous historical buildings. We’ve put the country through our Optimise Travel holiday destination test, and it certainly passes. Is there a wide variety of interesting things to see and do? Current exchange rates between the Australian dollar and the Turkish lira make Turkey a great value for money destination for Australian tourists, which is a bonus. As the graph below shows, this has been the case for the last few years in particular. The Australian dollar (AUD) will currently buy you approximately 2.04 Turkish liras (TRY), about double the figure of a decade ago when it hovered around the 1 lira mark. 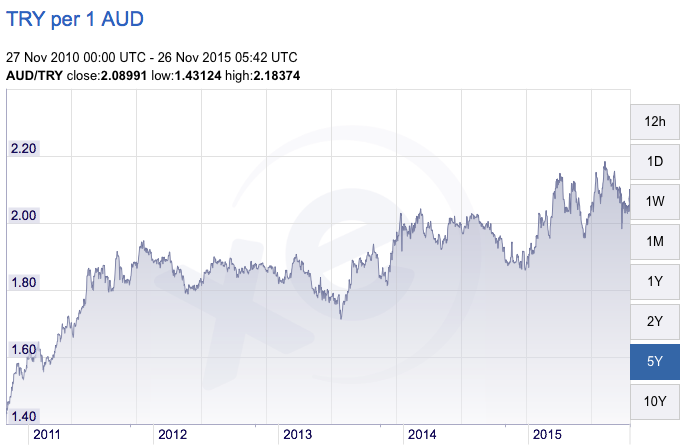 Even 5 years ago, an Australian dollar would only get you about 1.5 Turkish liras. So now is a good time to go. Before we get into those, you need to get your head around the geographic layout of the country, and in particular, appreciate two of its bordering countries. 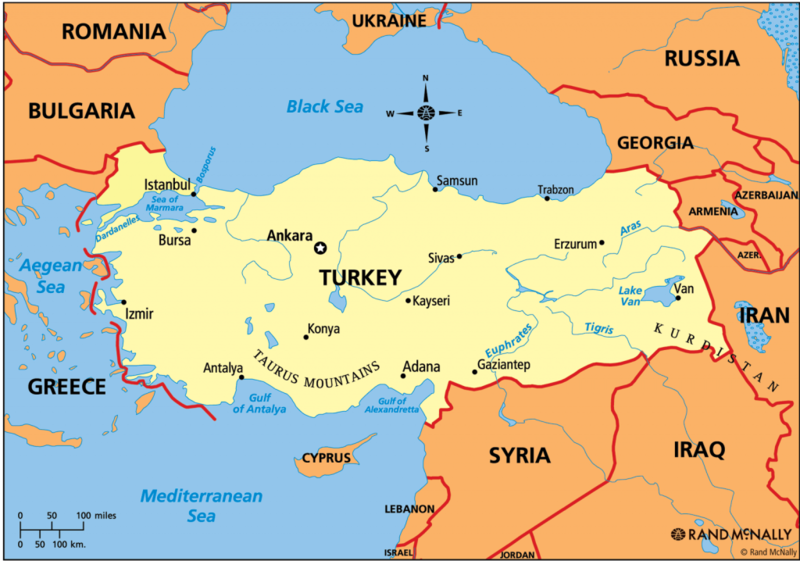 The capital city of Turkey is Ankara, and as you can see from the map below, the country is bordered by Syria and Iraq in the south, two countries that are currently in conflict. It is best to avoid Turkish regions that border those two countries accordingly. In addition, you need to appreciate that there will be an English language barrier to some extent in Turkey. Turkish is the official language, and while young people in Turkey may know some basic English, older people are less likely to know any. ANZAC Cove is a small, 600-meter long cove on the Gallipoli peninsula, about 200 kilometres south-west of Istanbul. It is where the ANZAC soldiers landed at dawn on April 25, 2015 (a date commemorated each year via the Anzac day public holiday in both Australia and New Zealand). 8709 Australians lost their lives in the ill-fated, 8-and-a-half month Gallipoli campaign of World War 1, and a further 19, 441 were wounded. 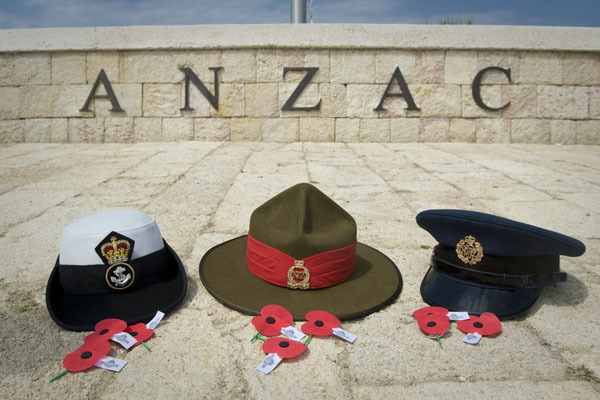 Each year thousands of Australians and New Zealanders trek to Gallipoli to pay their respects, firstly at the ANZAC Day dawn service, followed by visiting the grave sites of fallen soldiers. It is a truly moving and humbling experience. 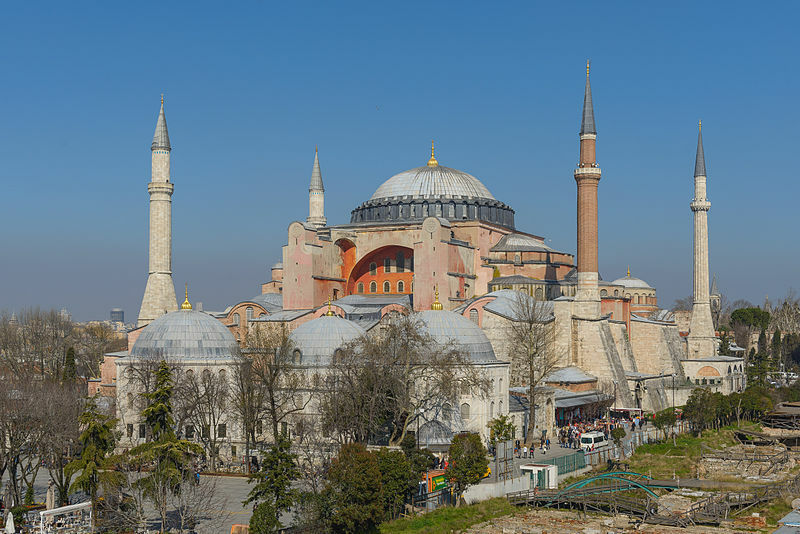 The Hagia Sophia was built in the 6th century and is remarkably well preserved. Formerly a mosque and before that a church, it is now a museum. Its distinctive architecture is a landmark in Turkey, and its inner walls feature a variety of striking religious mosaics. 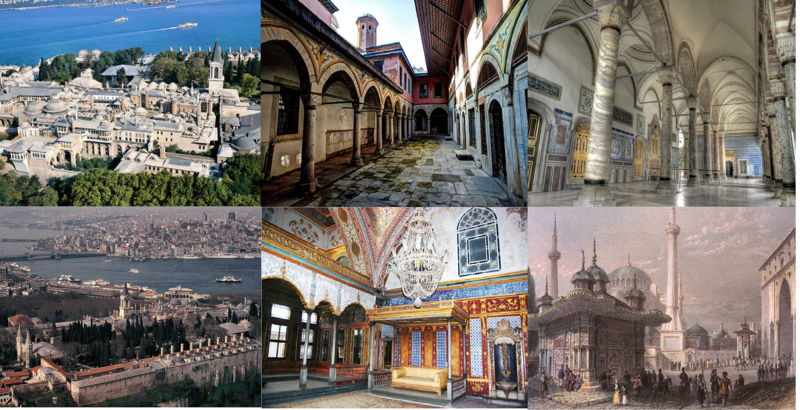 Topkapi Palace was a royal residence that also served as the administrative centre of Turkey from 1465-1856. It is now a museum containing artefacts from that era, holy relics and jewellery. 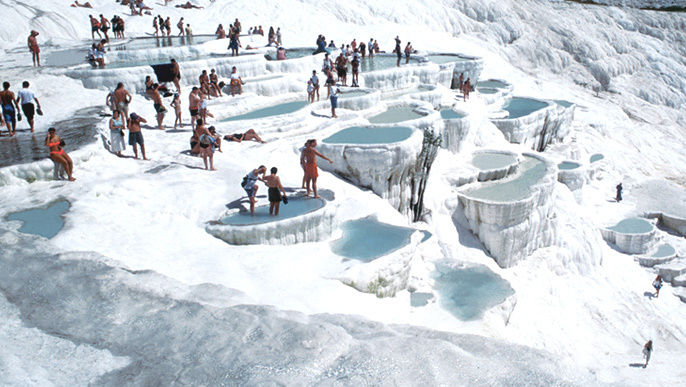 Meaning “cotton castle” in Turkish, Pamukkale is a distinctive travertine (white limestone) terraced hot spring landscape in the south-west of the country. People have bathed in its pools for thousands of years, and it is a World Heritage Site. 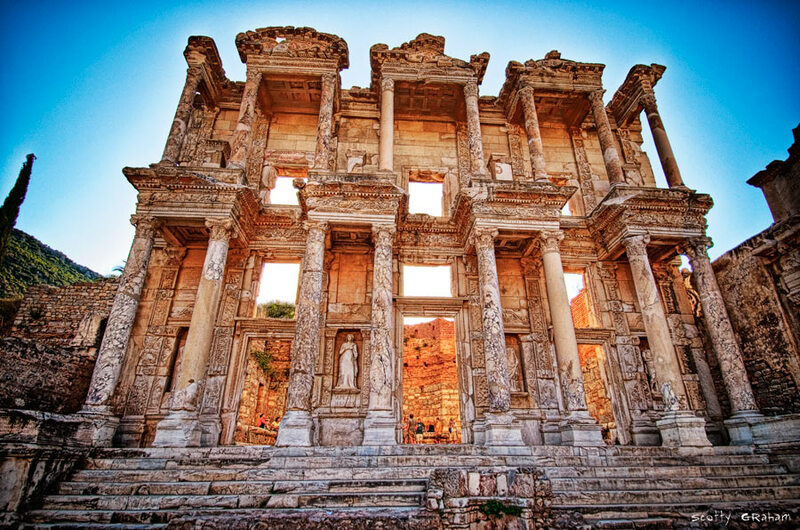 Ephesus is a city from the Roman empire in south-west Turkey that still has many of its monuments largely intact, as well as its marble-columned roads from that era. It is another World Heritage Site. 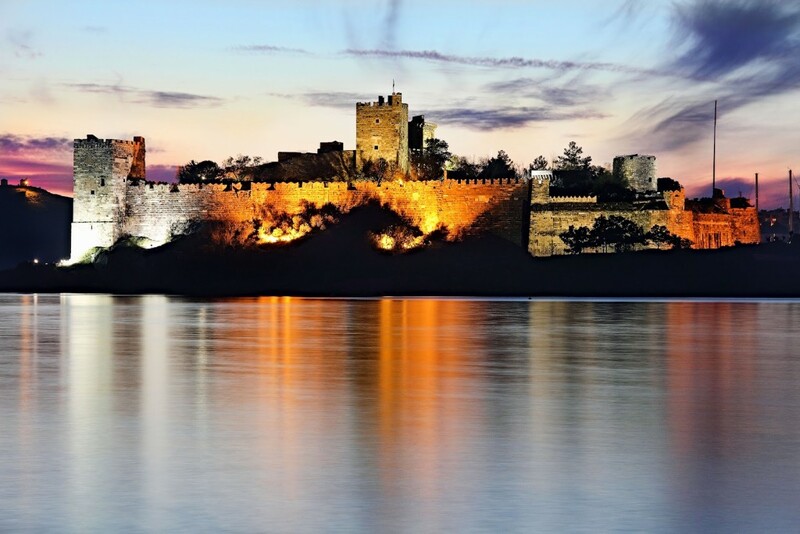 Built in the 15th century, Bodrum Castle in south-west Turkey has a fascinating history. It has been used variously over the years as a chapel, mosque, military base and prison. It is now an underwater archaeology museum, containing ancient shipwrecks extracted from the Aegean Sea. 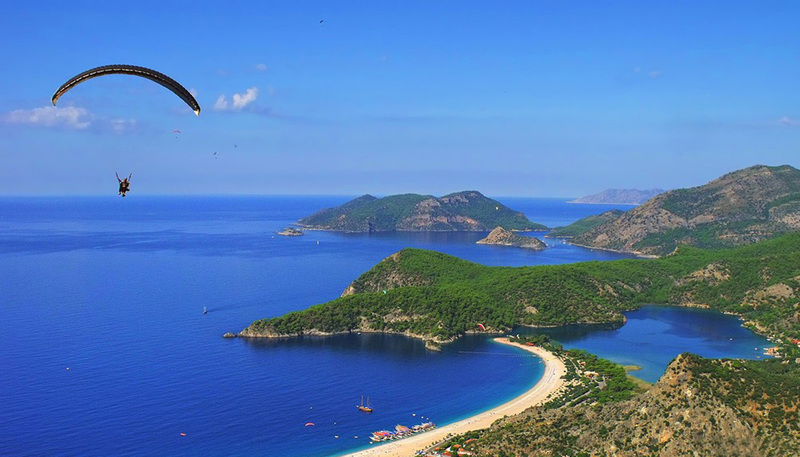 Ölüdeniz is a small secluded beach resort in Turkey’s south-west. Its turquoise coloured water makes it one of the most photogenic beach location in the world. Tandem paragliding is a popular option available to take in its panoramic views. Hundreds of tiny islands are scattered off the coast of Bodrum in the south-west, and these can be explored on a relaxing yacht cruise. 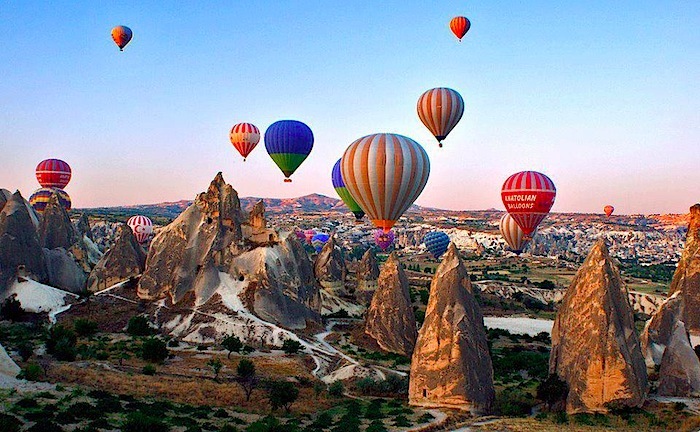 Cappadocia is a historical region located in the provinces of Nevşehir, Kayseri, Aksaray and Niğde in central Turkey. Its World Heritage listed rock formations and underground cities built hundreds of years ago provide lots of exploring opportunities for hikers. You can also take in the breathtaking views via hot air ballooning. Being located in the northern hemisphere, Turkey’s seasons occur at the opposite time to Australia’s. Coastal areas of Turkey tend to have hot, dry summers and cool to cold, wet winters. Winters in the interior of the country are more severe, with significant snowfall. Turkey’s major summer school holidays occur each year predominantly between mid-June and mid-September. A shorter 2 week winter school holiday period occurs during the last week of January and the first week of February each year. You can expect holiday destinations and accommodation within Turkey to be more crowded and expensive accordingly during these times, especially in summer. Islam is the major religion in Turkey, and in 2016 the Ramadan month of fasting will begin in early June. It is recommended that tourists respect the locals by not eating, drinking or smoking in public during this time, nor in the presence of people who are fasting. There are regular flights to Ankara and Istanbul (the two largest cities in Turkey) from most capital cities in Australia. It’s a long flight, taking between 16 and 19 hours from the east coast of Australia, based on one quick stopover at a connecting flight destination along the way (such as in Singapore or Dubai). Connecting flights are common for such a long journey. Your total travel time will obviously be affected by the length of any stopovers, so you should plan accordingly. Within Turkey, there are airports in each of its major cities. Flights between cities are relatively short by Australian standards. For example, a flight between Ankara and Istanbul only takes about 30 minutes. An example of a long flight within the country would be between Istanbul in the north-west to Erzurum in the east, which takes about 2 hours. The Australian government’s official advice from the Department of Foreign Affairs and Trade is that Australians should exercise a high degree of caution when travelling in Turkey. This is because there is a relatively high threat of terrorist attacks and kidnapping in the country, especially in regions near Syria, due to the on-going conflict in Iraq and Syria. In addition, as you should in any international country, pay close attention to your personal security and belongings in Turkey. You should also talk to your doctor about appropriate vaccines and preventative medicines before you go. In addition to the routine vaccines, for Turkey, you should prevent your chances of contracting any of the following diseases –hepatitis A/B, typhoid, rabies and malaria. Please Share your travel tips, tricks and stories about Turkey in the comments section so that others can benefit on their travels!